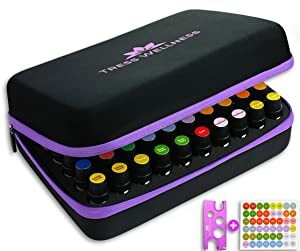 Essential oil storage boxes, including essential oil display boxes that are usually the same storage boxes used for showing your oils to your clients if you are a sales representative, professional aromatherapist, or home user. People have used boxes for centuries to store their treasures of jewelry, coins, small seashells, letters, and other special keepsakes. As a kid, I called my little wooden box my treasure chest for the special rocks and gemstones I found and fake pearl necklace. My brother had a box for his baseball cards and little toy cars. Highlight your treasured essential oil collection when you display your storage box anywhere at home, appointments, or presentations elsewhere. The oil bottles will be organized and protected by individual dividers. When you love your treasured and expensive 100% pure essential oils, you will want to keep them safe from sunlight and hot temperatures. Essential oil carrying/travel cases are important to have when you travel to keep them snugly in place in specially designed cases for that purpose. Read my essential oil storage box reviews for the best affordable brands. The zippered carrying cases have a hole in the zip tab for adding a small lock if you like. All the cases and boxes will hold the best brands such as dōTERRA®, Young Living®, Edens Garden®, NOW®, Rocky Mountain Oils™, Plant Therapy®, and many more. To learn more about the shelf life of essential oils, go here. The Earth’s Gift™ pine wood storage box is great for organizing your essential oils either alphabetically, by essence, or by label color. It has a handle on top for easy carrying and pull tabs on each of the 3 drawers. The ASIN B01MQTMZRK on Amazon.com® is inexpensive, so give one to a friend as a gift. The 3 drawers hold 75 each 15 mL bottles or smaller, 25 each 10 mL roller bottes for a total of 90 spaces to store bottles. The box will not hold 30 mL bottles. See product #2 for that box size. It will hold all the popular name brands of essential oils that you love. A large sheet of free sticking labels for your bottles come with this unit too. The drawers fit and slide well with its dove tail joints, and gorgeous detail. The front panel can be removed for portability. You will love the superb skillful artisanship involved building this durable storage case. The drawers have dividers for your bottles to keep them from touching. The dimensions of the unit are 8.5-inches long x 7.87-inches wide x 10.5-inches tall. It won’t take up much space on your furniture top. It weighs about 4-pounds empty. You can paint the box and give each drawer a different color too. Or if you like the natural wood color, you might want to shellac it or stain it another dark wood color such as maple or cherry. With this very safe and secure box cabinet for storage you can organize to your heart’s content, and take with you too. 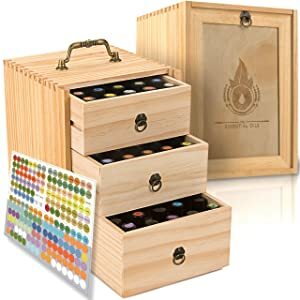 It is one of the best large wooden storage cabinets for all of your healing essential oils. Every oil bottle will be in one place for convenience when using them with your diffuser. Keep those expensive 100% pure essential oils (not included) protected from the sun, heat, moisture, light, and oxidation from UV light. Gift-wrapping is available for your friends. You will receive the world-class quality storage box and exceptional customer support. If you don’t absolutely love this wooden storage box, Earth’s Gift™ will provide you with a full refund plus their Lifetime Warranty against material and workmanship defects. It is made in China. 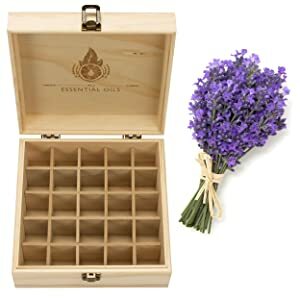 Earth’s Gift™ Essential Oils Storage Box review video. The Earth’s Gift™ natural pine wood essential oil storage box 30 mL is perfect for those of you who buy the 1-ounce (30 mL) bottles of essential oils (not included). It will also hold 10 mL roller ball bottles as well. Thus, it holds 25 oils or 50 tall roller balls. See the picture for the different combination size bottles this box will hold. The box measures 8.5-inches long x 8.5-inches wide x 4.5-inches tall. It weighs about 3-pounds empty. The purple inside top lid foam padding is removable and you will receive free sticky labels to put on your bottles. It will hold the 30 mL bottles that have the dropper tops! Organize your oils, display them for customers and presentations if you are a seller, or just store for your use only. The updated hinges keep the lid standing open at 90-degrees to not utilize space. The purple pad ensures your bottles will travel safely without spilling holding them snugly in place. The dividers are not removable. Gift-wrapping is available for your essential oil using friends. You will receive the world-class quality storage box and exceptional customer support. If you don’t absolutely love this wooden storage box, Earth’s Gift™ will provide you with a full refund plus their Lifetime Warranty against material and workmanship defects. It is made in China. The Rocky Mountain Oils™ folks not only make some of the best essential oils, they also make this lovely storage box with the RMO™ logo on the top lid. If your favorite brand is RMO™, this box is for you; however, it holds any brand oils. RMO™ is not an MLM (Multi-Level Marketing) seller. Selling directly to shoppers gives the buyers value for the price that is never inflated when they purchase 100% pure RMO™ essential oils for ultrasonic or nebulizer diffusers. 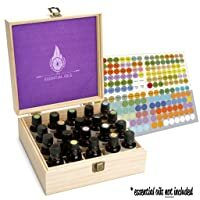 If you do use only Rocky Mountain Oils™ essential oils, this will showcase them in their own box holding 32 bottles in slots. It is also available in 16 bottle slots if you only have a few favorites in your arsenal of oils. I love RMO™ and that’s pretty much all I use storing them from sun and heat in their own box. The box is made of genuine pine wood that you can stain another wood color, paint, or simply shellac it for the natural look it has. The closure is magnetic to keep everything inside tightly shut. When you want to get inside the box, put your thumb into the indent below the lid, press lightly, and it opens. The 32-slot wooden box is 11.0-inches long x 5.76-inches wide x 3.25-inches tall. The 16-slot wooden box is 5.75-inches long x 5.75-inches wide x 3.25-inches tall. RMO™ gives a 90-day no hassle return policy and satisfaction Guarantee. Their products can be returned for any reason, even if opened, for up to 90-days. A refund back to the original form of payment will be issued after the product is returned. 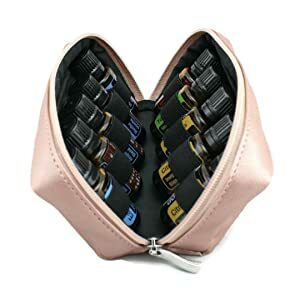 The Abrazo Designs™ essential oil travel case holder is the perfect solution for taking your 10 bottles with you when traveling or visiting. It holds 5 mL, 10 mL, and/or 15 mL bottles of your favorite reputable brands (not included). It will hold 10 mL roller bottles as well. I love this metallic rose color shown on Amazon.com® ASIN B01N3RUAE0 that is very affordable. Other colors available are gold and silver. The case is zippered with a nylon interior to hold your individual bottles tight and secure with the individual elastic bands inside. It measures 7-inches wide x 3.75 tall x 2.75-inches thick and weighs a slight 2-ounces. Gift-wrapping is available for someone who loves essential oils. It is made in China. 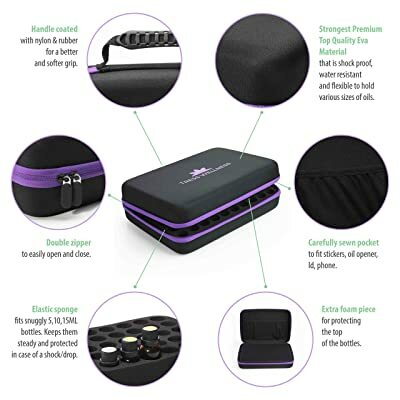 The Tress Wellness essential oil travel case will save you from having bottles lying loose in your luggage. This holds 70 each 5 mL, 10 mL, or 15 mL bottles plus the free sticky labels and bottle opener. The black with purple trim is stunning! Bottles with oil are not included. On Amazon.com®, the ASIN B076KQ41XH is a best-selling case with many positive reviews with many stars. If you’re an aromatherapist needing many oil varieties for your clients, this will be perfect for you. It’s also ideal for you essential oil distributors too. Being lightweight and compact, the case is made with a hard shell, is water resistant and shockproof to keep your bottles safe while traveling or keeping at home out of the sunlight and heat. It protects those precious essential oils very well. The double zipper is smooth and opens and closes without a hitch. The wide hand strap is convenient to have, and it’s made of soft foam to carry comfortably. Inside is a pouch under the lid to put your business cards, sticky labels, pipettes, bottle opener, and cell phone. The 192 free labels are 96 preprinted, 96 blanks with color but no text so that you can find the oil you need very quickly. This is a quality essential oil storage box 15 mL a favorite size bottle. The case has individual slots for each bottle and measures 13-inches wide x 9-inches front-to-back x 3.5-inches tall. It weights about a pound so is light to carry. Gift-wrapping is available for your essential oil enthusiast friends. If you are not satisfied with the case, Tress Wellness will send you a replacement or a full refund. It is made in China. The Hytek Gear travel case holds 30 bottles of 5 mL or 15 mL sizes. It is available in 12 lovely colors holding either 30 vials or 56 vials depending on your needs and is inexpensive. The ASIN B01H0P3ME8 on Amazon.com® has rave reviews with hundreds of buyers loving this travel/carrying case. It protects your glass bottles with a padded cloth interior. It is made of gorgeous high-quality cotton canvas with a double zipper closure. And it has a cloth top handle to carry it with. Holding all reputable brands of oils, you will be on your way with the lightweight case. Inside the top lid is a mesh storage pouch for your small items. You can store the case in the refrigerator, and the fabric is washable putting into a garment bag on the cool water gentle cycle of your clothes washer. Do not put in the dryer as it will shrink; let it air dry. Best to hand wash. But who wants to wash away the beautiful oil smells? The case measures 7-inches wide x 7-inches long x 3-inches tall. Sticky oil name labels and pipettes do not come with this case; however, they are inexpensive to buy on Amazon.com. The bottles, pipettes, and labels are for display purposes only. Gift-wrapping is available for your essential oil enthusiast friends and aromatherapists. It is made in China. No matter what you use your essential oils for, be sure to buy high quality essential oils and store them properly so that you can use them to their greatest effectiveness. Build your collection of essential oils with confidence as you become a happier, healthier, and more natural you! 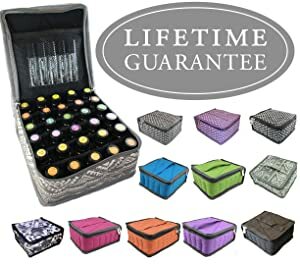 For you professionals, the boxes and travel cases are the better way to transport and store your treasure chest of pure essential oils so therapeutic and beneficial while smelling heavenly. Leave me a comment and let me know your favorite storage box in this review. Happy shopping!